India's Prime Minister Narendra Modi addresses a rally in a cricket stadium in Srinagar, India (November 7, 2015). Why India’s media was so ready to buy into the idea that Modi boycotted the Non-Aligned Summit. 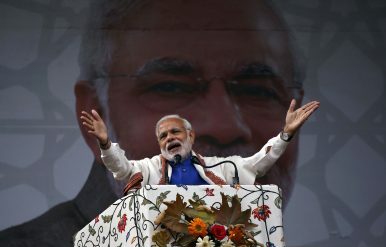 Over the course of his premiership, Narendra Modi’s often flamboyant sorties abroad have become a mainstay of India’s English-language news cycle. India has compiled an impressive photographic anthology of Modi’s embraces with powerful world leaders and has cataloged his exuberant reception by overseas Indians in New York, London, and Sydney. Yet in September of this year, a surge of media coverage broke with the norm. Journalists rushed to write up not another charm offensive, but instead a historic diplomatic snub. Modi, they reported, had skipped the Non-Aligned Summit in Venezuela, and in so doing had cast doubt on the movement’s continued relevance to India. A curious and polarized debate followed. Curious, because barely anyone stopped to question whether Modi had purposefully shunned the conference. And polarized, because the media’s seeming enthusiasm for the boycott clashed with the pro-Non-Aligned sentiment of several public intellectuals, including former foreign policy elites. Through the pages of influential national dailies, a clear divide was revealed: between a “vanguard” middle class-India that already sees itself as part of the First World, and an “old-school” establishment that remains wedded to the movement. What really drove Modi to miss the Summit became an irrelevant point. Instead, India’s association with the Non-Aligned was put on trial. On the question of why Modi was a no-show, nuanced context makes all the difference. Missing from most accounts were the conference’s persistent scheduling problems, following two postponements after original plans to meet in September 2015. In fact, attendance at the 17th NAM Summit was the product of eleventh hour diplomacy: Caracas was still delivering invitations to the Summit two weeks before the meeting. Inside sources from within the Venezuelan organizing committee confirm that Delhi desired to participate at the highest level, and attempted, to no avail, to pin down the conference’s final dates for more than a year. It was less a case of foreign policy realignment than of banal scheduling circumstances that only 12 heads of state turned up in Margarita, compared to the more than 30 world leaders in Tehran at the previous Non-Aligned Summit in 2012. A glance at Modi’s diary during the dates of the Summit suggests he was simply too booked up to travel. On the Summit’s second day, a visit from Afghan President Ashraf Ghani to the Indian capital saw Modi making a $1 billion development aid pledge to this important South Asian partner. On the Summit’s penultimate day, Modi was busy receiving blessings from his mother on his 66th birthday, celebrations for which crisscrossed the country but mostly centered on Modi’s home state of Gujarat. There, among other activities, groups of revelers sought to honor their prime minister through world record attempts: a 3,750 kg birthday cake didn’t make the cut, but a thousand wheelchair users snared the Guinness World Record title for the largest ever wheelchair logo, spelling out a birthday message to Modi. The reality of the delays, of course, was that overwhelming domestic challenges rendered Venezuela a beleaguered host. It is worth remembering that Venezuela’s decision to host the Summit was made back in 2012 – a time when the country was in relative calm and oil prices averaged above $100 per barrel. In the past year, however, the country has experienced continued recession, triple-digit inflation, food shortages, and protests ranging in character from handfuls of citizens banging pots and pans to marches involving hundreds of thousands of people. All of this culminated in political crisis for President Nicolas Maduro, who won the presidency in 2013 with only 50.6 percent of the vote, and has since been challenged by an opposition-led National Assembly elected in December 2015. The Summit was an opportunity for Maduro to shore up political support, domestically as much as internationally, and he wanted to do it well. The real story that needs unraveling, of course, is how Modi’s non-attendance at the Non-Aligned Summit could be so effectively mythologized into a purposeful policy maneuver and then seized upon to spark a national debate. As political scientist Sumit Ganguly has recently pointed out, Modi’s vision of India is of a country well on the way to becoming a great power. Reaching this destination depends — to use archaic but still meaningful language — not on close associations with the Third World, but on taking a long-deserved place among the ranks of the First. Modi’s vision is reflected back in what Nalin Mehta, an Indian social scientist and media watcher, describes as a “general middle class triumphalism which thinks that India has already arrived.” What makes the issue of India’s continued engagement with the Non-Aligned Movement so topical and so controversial is how it powerfully symbolizes this rising power’s pigeonholing within a developing country collective. Pockets of India’s middle classes fail to see the continuing relevance of this group of largely weak friends and instead expect India to have already graduated from this cohort. In catering to middle class triumphalism, and positioning Modi as a key agent in India’s global upgrade, the media often uncritically amplifies — or outright exaggerates — his agenda. Ashok Swain, Professor of Peace and Conflict Research at Uppsala University, Sweden, sees the Indian media overwhelmingly as a partner to Modi’s “aggrandized claims of policy successes,” including in the domain of foreign policy. For instance, Shekhar Gupta, a formidable force in Indian journalism, pointed to Modi’s Summit absence and concluded that he “has tossed away [the] past, and audaciously so.” This dynamic between Modi and the media explains how a rumor could be hyped, circulated, and interpreted as proof of change, even if later reports filed by what are known as “domain experts” on foreign policy were more careful in reporting the significance of Ansari’s attendance in lieu of Modi. That breaking away from the movement seems so central to India’s rise is underscored by the inconsistent scrutiny of Modi’s presence or absence at other world summits. In the days following the Non-Aligned Summit, for example, it was Sushma Swaraj, India’s minister for external affairs, not Modi, who could be seen returning the salvos from Pakistani Prime Minister Nawaz Sharif as state representatives gathered in New York for the 71st session of the UN General Assembly. Yet not one reporter thought to suggest that Modi failed to hold India’s UN representation a priority. While the establishment view of India’s path to greatness has reliably emphasized India’s crucial positioning as a bridge between the Global North and the Global South, such a vocabulary is increasingly out of fashion in the English-language media. The divide between those who are eager to leave the Third World behind and those who see it as integral to India’s rising strategy is growing. But the substance at Margarita shows that the movement remains a stakeholder in the global order, even if that order is now defined more by the contested liberal hegemony of the West than by the bipolarity of the Cold War. The conference was a hotbed of dissension against liberal internationalism, as reflected in discussions over economic governance, regime change, unilateral sanctions, and reform of the Security Council. It cannot be ignored that with over 120 member states, the movement is the second largest international body after the United Nations and represents over 50 percent of the world’s population. Its prestige of numbers alone gives weight to its views on the normative dilemmas of global multipolarity. As far as India is concerned, at least three of the movement’s key goals remain relevant to its foreign policy: sovereign equality in international law, non-intervention in the domestic affairs of states, and the prioritization of economic and social rights in international human rights policy. These goals echo New Delhi’s interests in domains as diverse as UN reform, peacekeeping, trade negotiations, and even climate change. All of this suggests that India should not abandon its old-school, pro-nonaligned commitments too readily, regardless of the views of its status-hungry media. It is in the Indian interest that New Delhi, now perhaps more than ever before given its closer relations with the United States, can serve as an interpreter between those invested in the reigning liberal world order, and those critical of its premises and political outcomes. Few rising powers can lay claim to such a unique global positioning. Kate Sullivan de Estrada is Lecturer in Modern Indian Studies at the University of Oxford and researches and teaches on India’s international relations. Her writings on Indian politics and foreign policy for a generalist audience have appeared in The Hindu, The Indian Express, The Week, Inside Story, and The Diplomat, among others. Patrick Quinton-Brown is DPhil candidate in International Relations at the University of Oxford, where he researches the history of the Nonaligned Movement and the legitimate use of force in international society. He is former Managing Editor of the St Antony’s International Review.